A magnificent sterling silver Celtic Shamrock pendant. This fabulous piece of Irish jewellery features the Shamrock – a national symbol of Ireland. The Shamrock, encrusted with clear cz stones, sits in the centre of an open teardrop shaped pendant and is surrounded on each side by climbing leaves. This Irish pendant is the perfect gift for yourself or for someone you love. The Shamrock is widely associated with Ireland because of Saint Patrick. Saint Patrick is believed to have taught Christianity in Ireland with the Shamrock. The three clovers on the Shamrock represented the Father, the Son and the Holy Spirit. 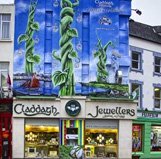 Today the Shamrock is seen on many pieces of Irish jewellery.